Action Pack emagazine for kids launched its 2012 family cooking issue and boy were we excited to get a copy for review! Our little guy starts day camp this week and his first week is all about cooking classes. He's so excited about learning new skills and cooking for his parents! We are too (and a little nervous, heh). Aside from a keen interest in cooking there are several good reasons to encourage kids to dabble in the culinary arts. It's one of those all round activities; a practical life skill, a science AND an art. As a bonus it offers an opportunity for a greater appreciation for food in general. And what it takes to get it on your table. 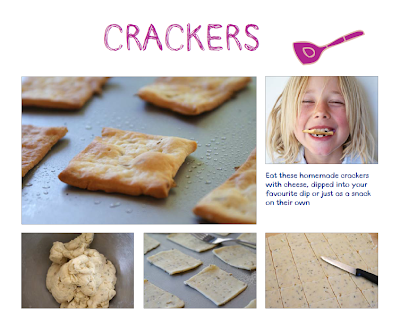 I think making crackers from scratch would be a great first recipe to do with him. 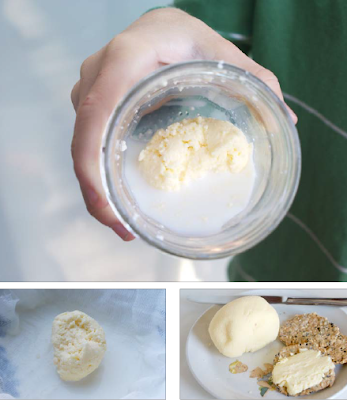 And how about a little homemade butter to go with that? Yes, please. Other reasons you might want to pop over to whip up and buy a printable pdf for yourself? Well there are 30 reasons in total but how about spinach and feta rolls (do you think if my kid made them he would actually eat spinach?) or Anzacs Bikkies (I don't know what they are, probably due to my northern hemisphere tendencies, but I'm dying to try them!). The recipes seem to range a bit in difficulty, particularly geared towards the 9 - 12 year old set but with more adult support also good for a younger crowd. The some 60 page downloadable pdf costs $10.